Income Tax Day, c. 1920. 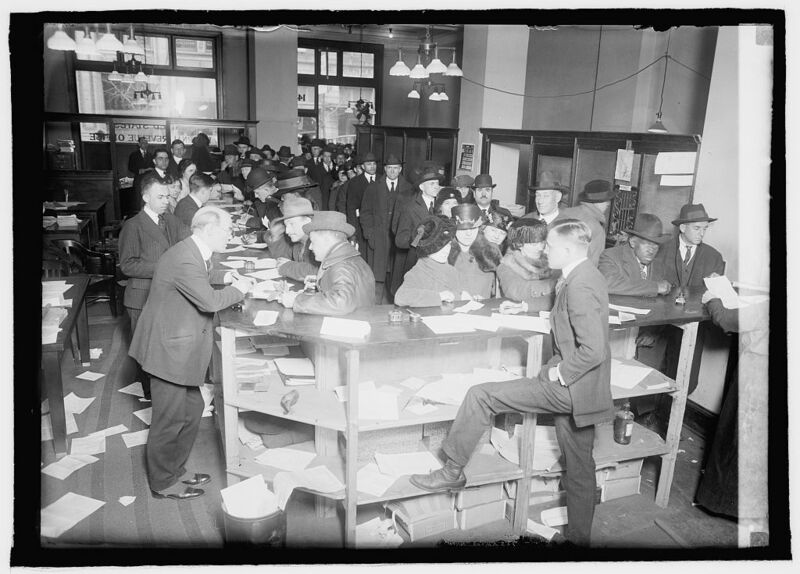 Citizens line up at an unidentified Revenue Office to pay their federal income taxes. Photo: National Photo Company. Courtesy of the Library of Congress, Prints and Photographs Division. The topic of Prohibition conjures up visions of speakeasies, flappers, jazz, and hidden flasks. But what about income taxes? In addition to the history of the 18th (1919) and 21st Amendments (1933), there’s another amendment that is crucial to the story of Prohibition. The 16th Amendment, ratified in 1913, made it possible for the federal government to establish a nationwide income tax. While we might not wish to contemplate that history as another Tax Day deadline rolls around, it was crucial for the passage of Prohibition. 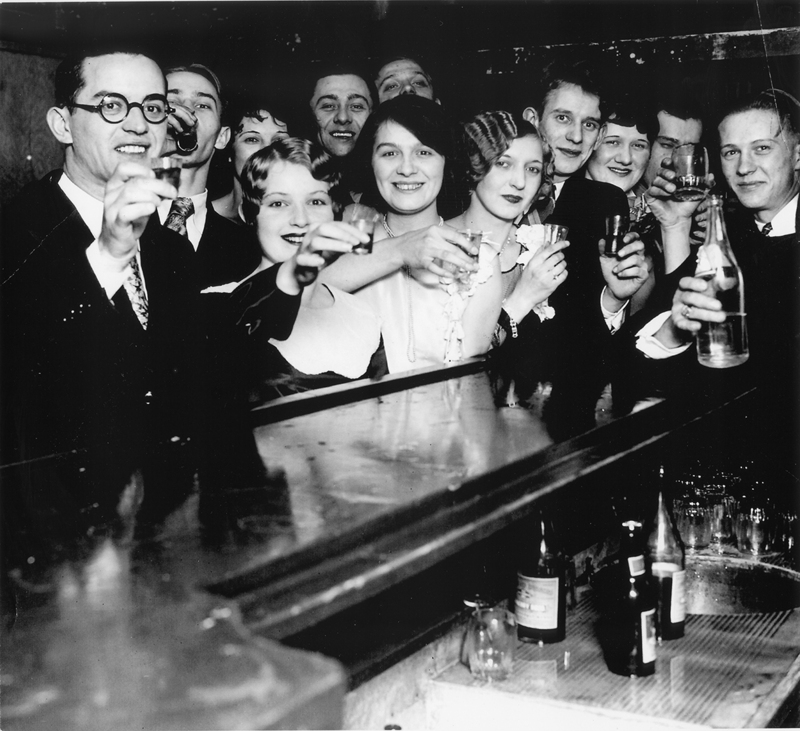 Speakeasy patrons toast the end of Prohibition in 1933. 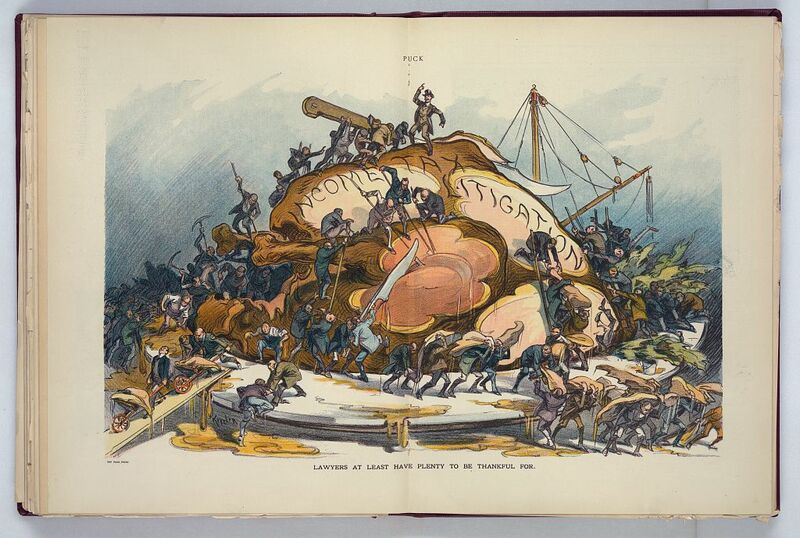 Taxation issues impacted both the beginning and end of America’s experiment with the 18th Amendment. Courtesy of the John Binder Archives. Many scholars believe that without the shift to a national income tax, winning support for the 18th Amendment would have been impossible. For decades, the government relied on taxes paid by the alcohol industry to fund a healthy chunk of the national budget. While early experiments with the whiskey tax didn’t go so smoothly (among them was a little diversion in western Pennsylvania called the “whiskey rebellion”), in 1861 President Abraham Lincoln brought back an alcohol tax to help pay for the Civil War. After the war ended, the tax never went away. By the early 1900s, as much as 30 to 40 percent of the government’s income came from taxes generated by liquor, wine, and beer. By 1910, the federal government was drawing more than $200 million per year from the alcohol industry; only external trade tariffs generated greater revenue. Taxes on alcohol were so crucial that many brewers and distillers simply didn’t take early efforts at Prohibition seriously. How could the government ever give up such a rich source of income? “The New Man on the Job,” 1913. 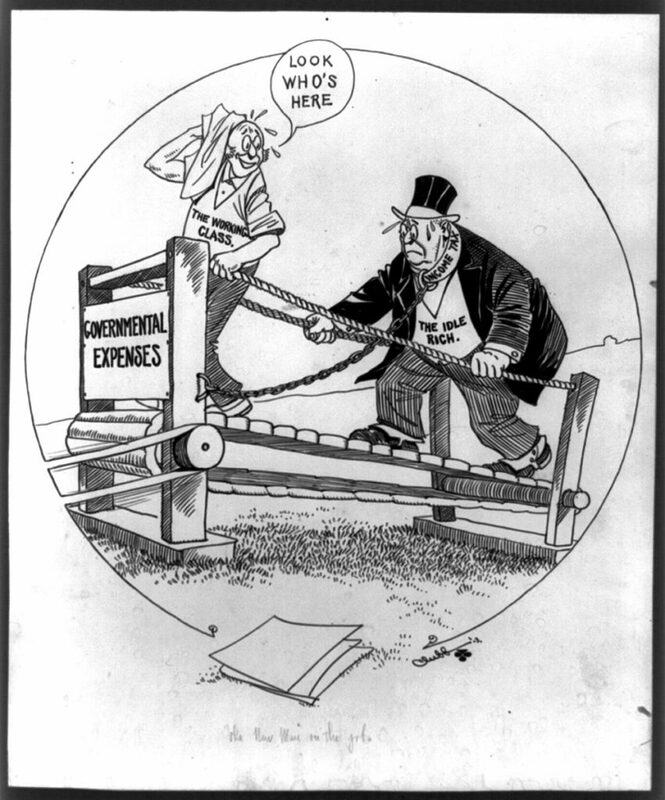 This cartoon depicting the “Idle Rich” joining the “Working Class” on the treadmill of “Governmental Expenses” symbolizes how tax advocates viewed the adoption of an income tax in 1913. Courtesy of the Library of Congress, Prints and Photographs Division. “Lawyers at least have plenty to be thankful for,” 1913. Artist Udo J. Keppler depicts hordes of lawyers descending upon the feast of lawsuits brought about by the new income tax law, 1913. Courtesy of the Library of Congress, Prints and Photographs Division. “Exit Income Tax,” 1895. 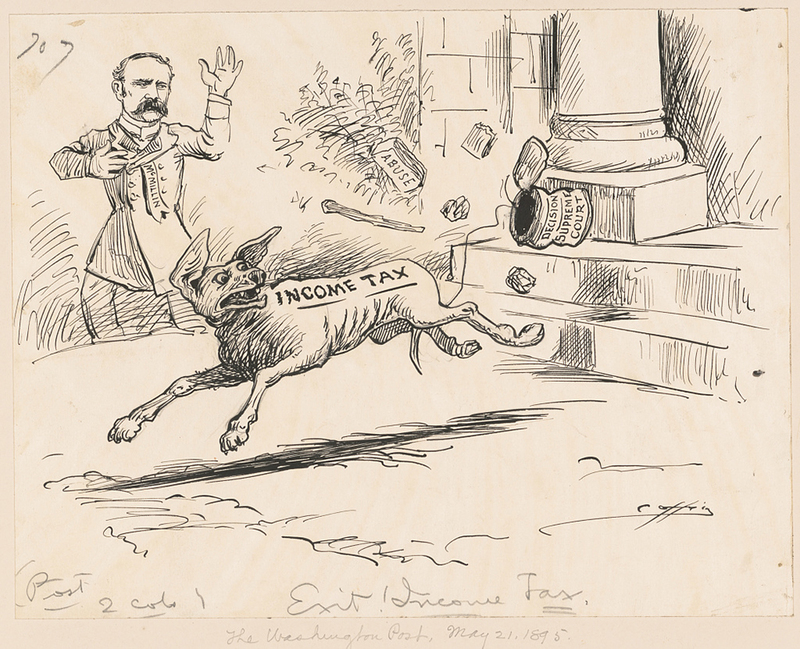 Artist George Yost Coffin cartoon depicts the 1894 effort to establish a national “income tax” as a dog with a can tied to its tail, being scared away by rocks and abuse. (The man in the background is Tennessee Congressman Benton McMillin, the politician responsible for trying to get the tax passed.) Courtesy of the Library of Congress, Prints and Photographs Division. But they guessed wrong. By the early 1900s, a new wave of Progressive politics was sweeping the nation. The idea of an income tax had long been favored by some tax advocates as a way to balance out the huge fortunes being earned by a few individuals. Needless to say, this idea did not appeal to everyone. An 1894 effort to establish a limited income tax was overturned by the Supreme Court in 1895. (If you want to learn more about that case, you can read about it here) But the lessons learned from that experiment helped shape the framing of the 16th Amendment, which passed as a Congressional resolution in 1909, and was ratified four years later. In a fitting irony, concern about taxes contributed to the downfall of Prohibition 13 years later. With the rise of the Great Depression following the stock market crash of 1929, the potential for the once mighty alcohol industry to generate new jobs as well as more income and sales taxes helped shift political will back the other direction. Cities such as New York and Detroit witnessed “Beer for Taxation” marches. Local citizens filled city streets encouraging the renewed use of beer to generate jobs and revenue. By the time Franklin Delano Roosevelt was elected President in 1932, it was clear that Prohibition was coming to an end. “Dream of Prosperity” postcard, c. 1930. 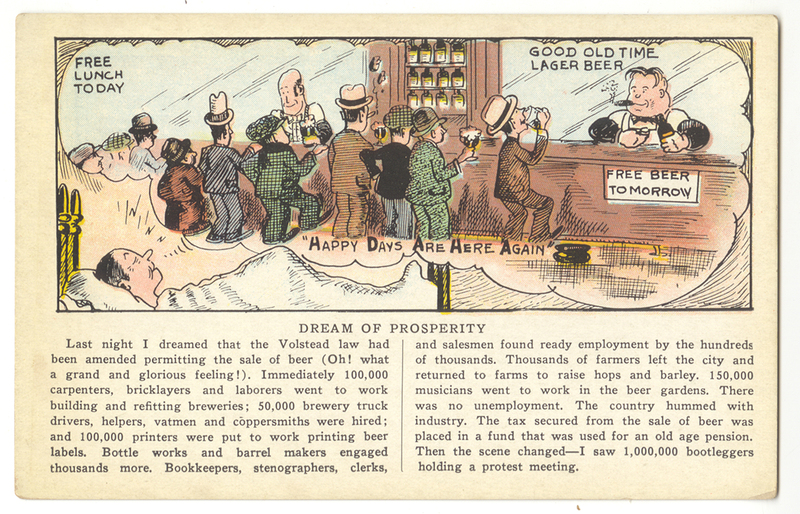 By the early 1930s, many Americans agreed with the sentiments of this postcard, which envisioned the thousands of carpenters, laborers, drivers, bottle makers, clerks, and other people who would find jobs if beer sales were legalized again. Courtesy of a private collection. Beer for Taxation parade, 1932. 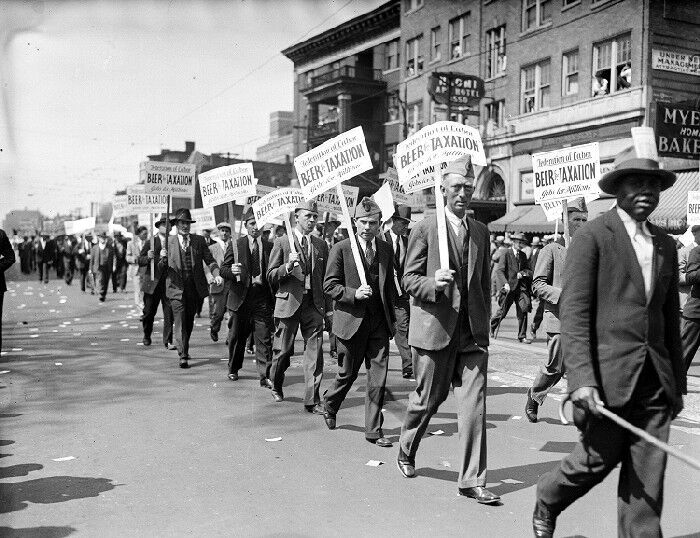 Protesters staged “Beer for Taxation” parades in multiple American cities in 1932, advocating for the legalization of beer and the return of the beer industry’s many jobs and tax revenue. Courtesy of the Walter P. Reuther Library, Archives of Labor and Urban Affairs, Wayne State University. Learn more about the history of America’s experiment with Prohibition now through June 10, 2018 in the American Spirits: The Rise and Fall of Prohibition exhibition. Leslie Przybylek is senior curator at the Heinz History Center.